In Natural Law, you were created equal to any other man or woman, and you were endowed with certain inherent Unalienable Rights that you possess as your lifelong private property. Your Unalienable Rights were not given to you by any man-made authority, nor can they be taken away by any man-made authority. 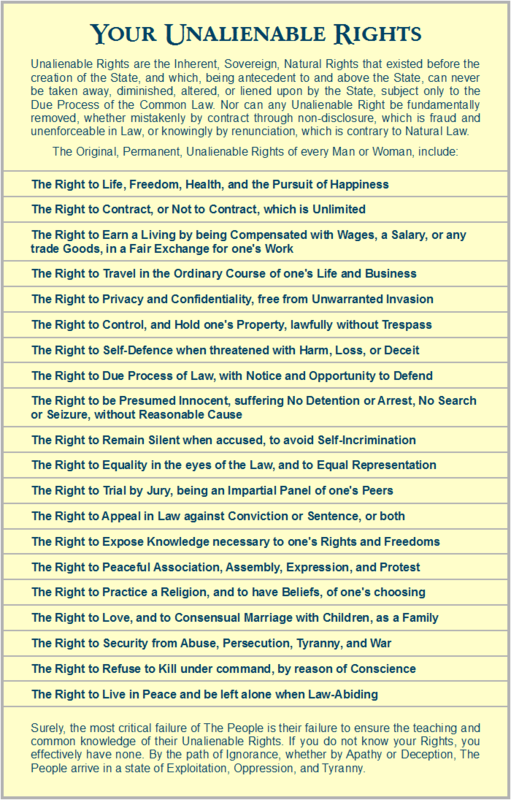 The State, as a creation of the People, can only acknowledge, uphold, and protect your Unalienable Rights. However, your sovereign nation has been usurped by YOURNATION (INC.), which is bankrupt and using a debt-money system. The real property, wealth, assets and productivity of the People have been pledged as Surety for the corporate national debt. This was done, and is perpetuated, by offering contracts to the private sovereign People. By contract, your private Rights and Properties can be exchanged for public Privileges and Benefits offered by YOURNATION (INC.). By contracting into a foreign jurisdiction (Admiralty Maritime, the Law of the Sea), the sovereign People remove themselves from the protections afforded by their sovereign nation in the Common Law jurisdiction, the Law of the Land. For example, in the United States corporation, the “Bill of Rights” and the “Constitution for the united States of America”, do not apply to a “US Citizen” of the corporation. The corporate takeover of your sovereign nation, and the subsequent denial of your Unalienable Rights by non-disclosure, is treason.